had turned very cold & windy. I made grape jelly and baked bread today. Will went to town in the afternoon. Charlie Hedges went home. 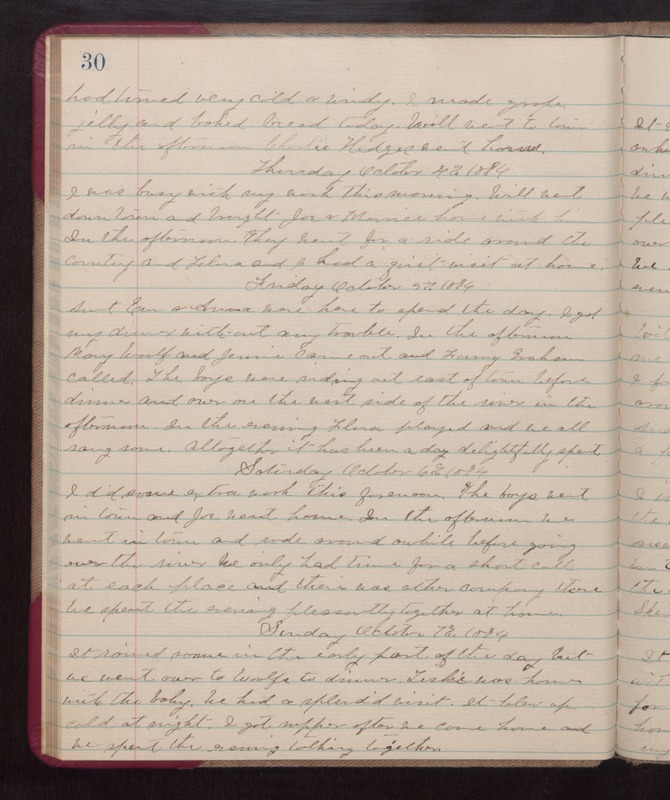 Thursday October 4th 1894 I was busy with my work this morning. Will went down town and brought Joe & Maurice home with him In the afternoon. They went for a ride around the country and Flora and I had a quiet visit at home. Friday October 5th 1894 Aunt Ems & Anna were here to spend the day. I got my dinner without any trouble. In the afternoon Mary Woolf and Jennie came out and Fanny Graham called. The boys were riding out east of town before dinner and over on the west side of the river in the afternoon. In the evening Flora played and we all sang some. Althogether it has been a day delightfully spent. Saturday October 6th 1894 I did some extra work this forenoon. The boys went in town and Joe went home. In the afternoon we went in town and rode around awhile before going over the river. We only had time for a short call at each place and their was other company there We spent the evening pleasantly together at home. Sunday October 7th 1894 It rained some in the early part of the day but we went over to Woolfs to dinner. Tishie was home with the baby. We had a splendid visit. It blew up cold at night. I got supper after we came home and we spent the evening talking together.